Five Finger Maidenhair Fern is a lovely woodland native, thriving in moist humus rich soils. Preferring cool summer temperatures, Adiantum pedatum is hardy all the way to zone 2. 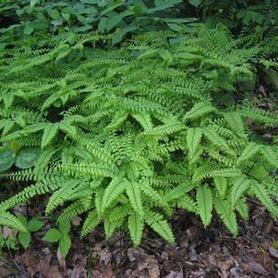 The bright green airy fronds are made more attractive by the shiny wiry black stems. Since Maidenhair Fern spreads by rhizomes on the surface of moist soils, it can eventually form an excellent woodland groundcover. 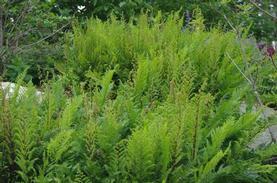 This fern will not perform well in full sun or hot summer sites. The medium green delicate foliage of 'Lady in Red' Lady Fern is set off by deep red stems for a striking effect. A deciduous clump. 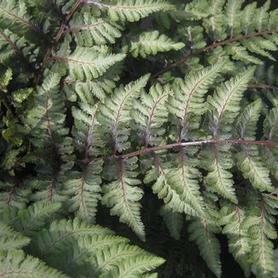 Japanese Painted Fern has showy silver, purple and green foliage. It is a deciduous creeper. Athyrium nipponicum 'Pictum' was the 2004 Perennial Plant of the Year. 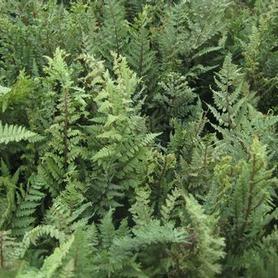 'Ghost' Lady Fern is a hybrid of A. filix-femina and A. nipponicum 'Pictum'. This fern combines the best of its parents in its brilliant silvery coloring on a light green background. The habit of Athyrium x 'Ghost' is somewhat upright and the color lights up dark spots amazingly. A deciduous clump which slowly widens, 'Ghost' was found in a garden in Richmond, Virginia as a spontaneous seedling.